One of the fundamental aims stated by BMW for its return to GP racing in 2000 was the creation of synergies between F1 and series production. The development of the Formula One powertrain and electronics has been integrated with impressive effectiveness at the Munich plant. The BMW Research and Innovation Centre (FIZ), a type of automotive think-tank, plays a key role in this process. The F1 factory was built less than a kilometre away from the centre and the two facilities are interconnected. "The FIZ represents the future of BMW, with elite engineers working in state-of-the-art research and development facilities," says BMW Motorsport Director Mario Theissen. "The FIZ has vast resources at its disposal, from which we benefit directly. At the same time, due to the extreme technical challenges and pace of development demanded by grand prix racing, the company's involvement in F1 represents a unique proving ground for our engineers." 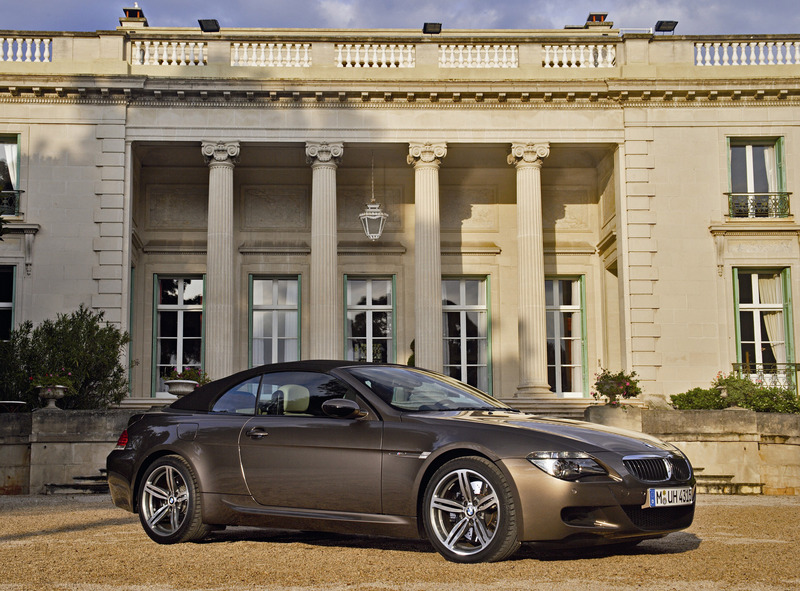 The expertise acquired remains within the company, where it benefits the development of production cars. Knowledge developed for use in Formula One in the machining of different materials and components, e.g. 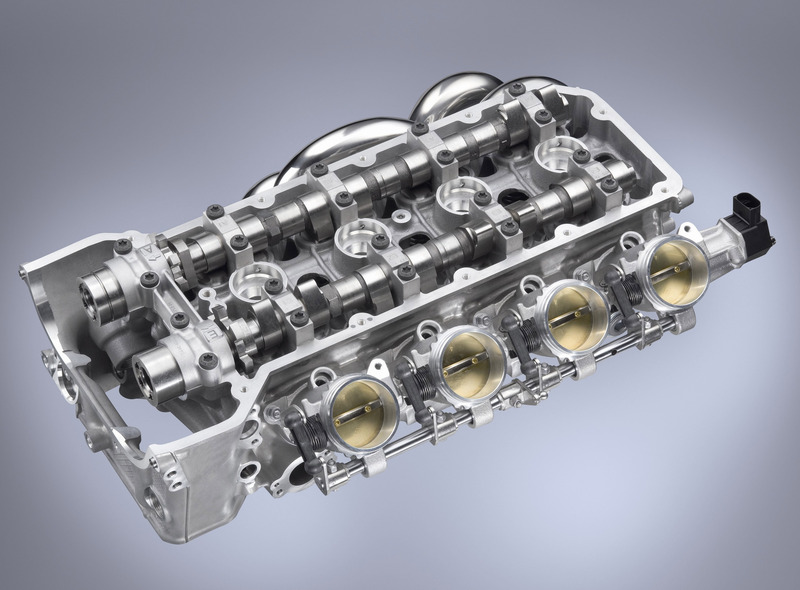 cylinder heads and crankcases, finds its way into both the construction of seriesproduced passenger cars and the development of motorcycles at BMW Motorrad. Other areas of focus include the advancement of expertise in CFRP materials and their use in body construction, and the development of hybrid components for Formula One and derivatives for road cars. Series production also enjoys the fruits of development and logistics processes honed in the world of F1. Examples include the progress made in the field of aerodynamics and the systems control unit. KERS powers Formula One into a new dimension. Hybrid technology in Formula One has been given the go-ahead and the development process is under way. Powered by a modified drive concept, the top category of motor racing is poised to enter a new dimension in 2009 – and deliver significant impetus for the development of standard production vehicles in the process. From the start of next season, the Formula One regulations allow for the use of hybrid technology to increase the output and efficiency of the cars. To this end, the BMW Sauber F1 Team is working flat out on the development of its KERS (Kinetic Energy Recovery System) brake energy regeneration system. BMW Sauber F1 Team enhances the hybrid expertise of the BMW Group. As Dr Klaus Draeger, member of the BMW AG Board of Management responsible for development, reports: "The BMW Group can transfer the knowledge gained within the BMW Sauber F1 Team directly into the development of standard production vehicles. This makes Formula One the ideal predevelopment platform for innovative drive technologies. The new Formula One regulations give us the opportunity to use innovative hybrid technology under extreme conditions and in so doing to garner crucial expertise for series development as well. BMW customers stand to benefit as a result. The KERS unit designed for the BMW Sauber F1.09 is a highly effective variant of brake energy regeneration technology, and is similar in the way it works to the ActiveHybrid technology developed for BMW standard production vehicles." BMW Sauber F1 Team develops electric KERS system. KERS enables the regeneration and storage of braking energy, which is then put on tap as an extra source of power under acceleration to complement the output of the V8 engine. The BMW Sauber F1 Team has decided to focus its efforts on an electric solution. The BMW Sauber F1.09 will be equipped with a hybrid system consisting of a combination of electric engine and generator, the requisite power electronics and an energy storage module. The BMW Sauber F1.09 will store enough energy under braking to provide an additional 60 kW of output over some 6.5 seconds of acceleration. The complete system will weigh under 40 kg. This means that the power density of the F1 KERS technology will be considerably greater than that of the systems currently used in standard production vehicles. The newly acquired expertise will flow straight into production car development over the years to come. " For us KERS is an extremely exciting project and a great opportunity. We are standing at the threshold between a conventional package of engine and independent transmission and an integrated drive system," explains Mario Theissen. "The power density of the KERS components will far exceed that of today's hybrid vehicles. KERS will see Formula One take on a pioneering role for series production technologies going forward. F1 will give a baptism of fire to innovative concepts whose service life and reliability have not yet reached the level required for series production vehicles, and their development will be driven forward at full speed. At BMW we have always used the Formula One project as a technology laboratory for series production. With KERS this approach takes on a whole new dimension. Formula One will reposition itself and undergo a change of image, allowing the sport to take significant strides forward in terms of public acceptance." 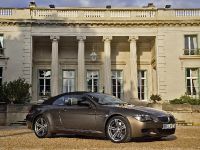 The BMW Group already features a brake energy regeneration system in a large number of its series-produced models as part of its BMW EfficientDynamics package. 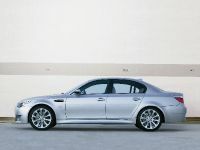 It is also preparing to introduce BMW ActiveHybrid technology in various model series. Casting technology for Formula One and series production. The casting quality of the engine block, cylinder head and gearbox plays a crucial role in determining their performance and durability. 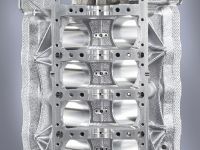 Advanced casting techniques, coupled with high-precision process management, enable the production of lightweight components with impressive rigidity. To ensure that production models benefit from these developments, BMW has its own foundry in Landshut. In 2001, this was joined by a dedicated F1 casting facility. The two departments are jointly managed to ensure a constant exchange of information and expertise. 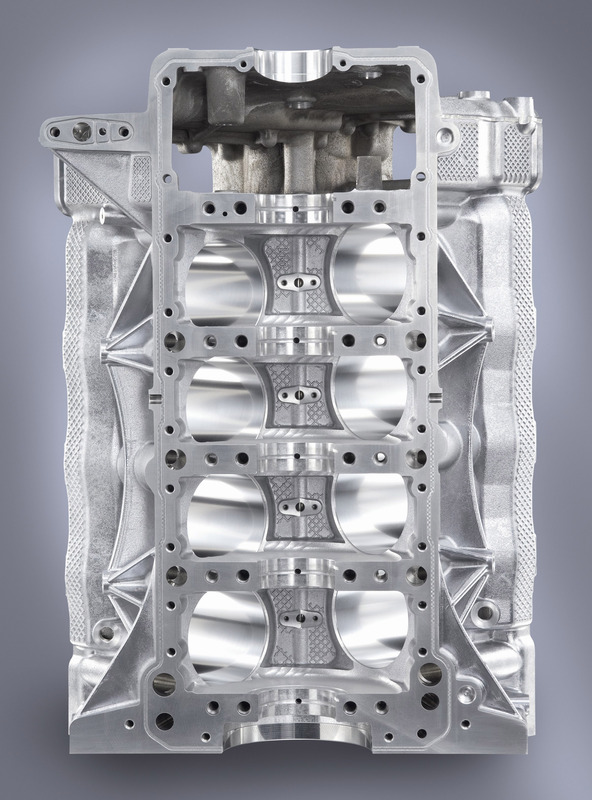 The same sand-casting procedure as is used for the production of the Formula One V8 engine is also applied to oil sumps for the M models, the intake manifold for the eight-cylinder diesel engine and prototypes for future generations of engines. Virtually at the same time as the F1 foundry went on stream, an F1 parts manufacturing facility based on the same template joined the series production facility. This is where the team make components such as the camshafts and crankshafts for the F1 engine. The BMW Landshut Plant: an integral part of the BMW worldwide production network. The Landshut Plant has been an integral part of the BMW Group's production network since 1967. The components made here are delivered to the company's engine and car plants around the world and used in virtually all the vehicles built by the BMW Group – from motorcycles and BMW cars to the BMW Sauber F1 Team Formula One racing car. A workforce of some 3,300 employees produce cylinder heads and crankcases from aluminium castings, instrument panels, bumpers, plastic components for the interior and exterior, drive shafts and reconditioned engines. 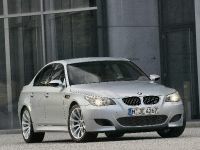 The component manufacturing work at Landshut has been adapted in line with the technological development of BMW vehicles. Today, the plant is incorporated into the development processes for the company's vehicles at an early stage in order to make even better use of the benefits of innovative materials and manufacturing processes in the construction of new vehicles and their components. The Landshut foundry is the only facility within the BMW Group's worldwide production network which manufactures components from light-alloy castings. Each year, the employees produce around 1.8 million engine components with a total weight of more than 30,000 tonnes. A special feature of the Landshut light-alloy foundry is that five different casting methods are used in series production: sand-casting, gravity and low pressure permanent mould casting, die casting and lost foam casting. The foundry specialists select the right casting process for the engine concept, technological requirements and production volumes concerned in order to achieve the highest possible standards for the engines. The sand-casting centre of technology. The sand-casting centre of technology is not only the production location for the cylinder heads and crankcase of the BMW Formula One engines, but also a highly specialised prototype centre for the development of future series components. The cylinder heads and crankcase for virtually every BMW series-produced engine will continue to be manufactured in the development phase in the Landshut sand-casting centre of technology. The specialists at the centre have made steady improvements in the process of sand-casting – which dates back several thousand years now – for the manufacture of the components. 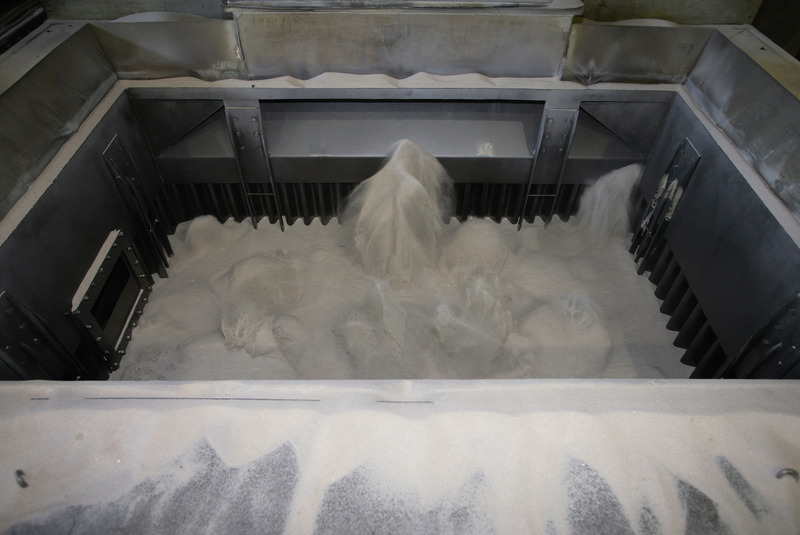 Significant construction freedom, high alteration flexibility and short processing times are all characteristic features of a process which sees the liquid aluminium poured into a complex negative sand mould made up of up to 30 different cured sand cores. In order to speed up the manufacture of the sand cores – made up of sand and synthetic-resin binder – the sand-casting centre of technology uses innovative rapid prototyping technologies developed specially for this application. These technologies employ computer-controlled processes to produce the sand cores directly from the design data without using moulds of the engine components. The Landshut foundry also uses rapid prototyping technology for the manufacture of sand cores for prototypes and test engines, helping to substantially shorten testing processes in the development of series-produced engines. Meanwhile, the process of computer tomography familiar from the field of medicine is used to check over components for the Formula One and test engines. This allows the non-destructive measuring of the inner and outer contours of engine components. 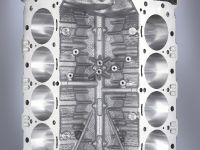 By comparing these measurements with the design data, the engineers can examine whether the cylinder head is accurate to the prescribed dimensions and ensure that the casting process meets the required standards of quality. 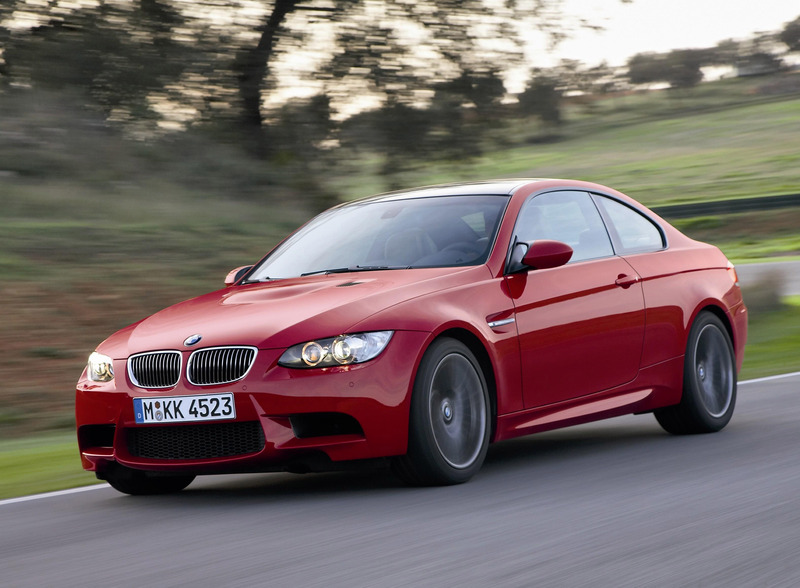 These technologies are also used in the manufacture of the V8 engine for the BMW M3. 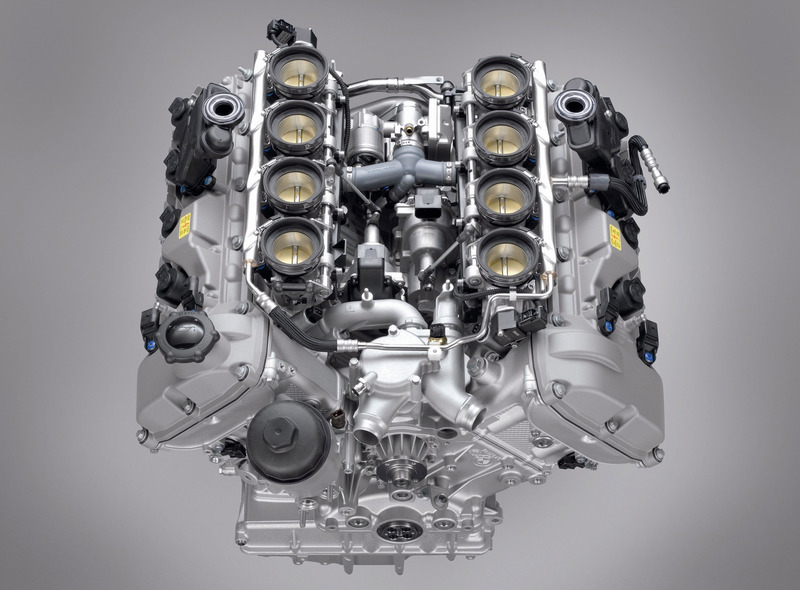 The engine: the thrill of a V8 powerplant designed to ideal dimensions. 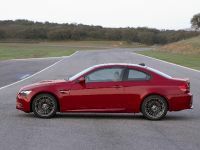 An exceptional power unit for an exceptional sports car: the V8 under the bonnet of the new BMW M3 raises the driving pleasure offered by the BMW M GmbH high-performance car to a level never seen before – and in so doing provides a compelling answer to the question posed by sports car fans worldwide: can things really get any better? After 15 years and two model generations, a successor has been found to the era-defining six-cylinder unit – crowned "Engine of the Year" on multiple occasions and developing 252 kW/343 hp at the latest count. 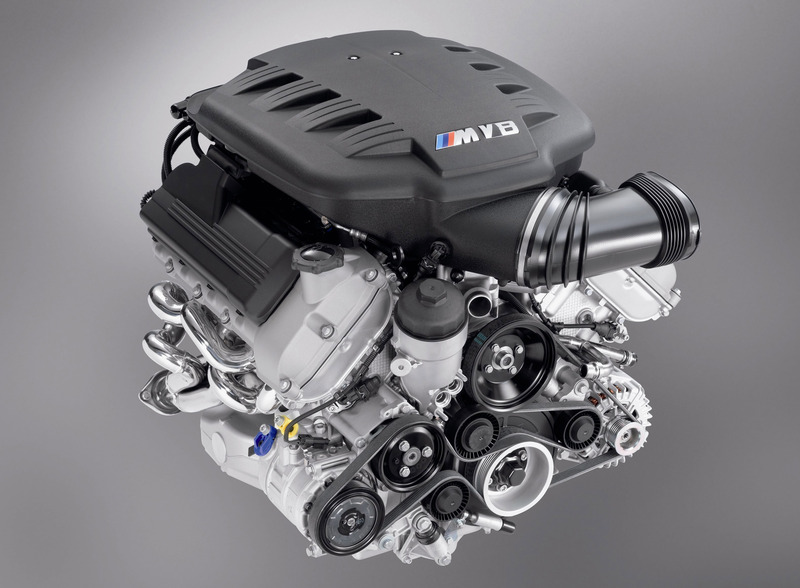 The eight-cylinder powerplant for the new BMW M3 takes the number of cylinders, displacement, output and engine speed to new levels for this sporting icon, instantly raising the pulse in the process. The combination of this powerplant with the unique vehicle concept underpinning the M3 exudes sheer fascination. The technical vital statistics of the new high-performance powerplant document the enormous leap forward which this change of engine represents. 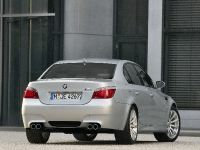 Displacement: 3,999 cc, output: 309 kW/420 hp at 8,300 rpm, peak torque: 400 Nm, maximum engine speed: 8,400 rpm. 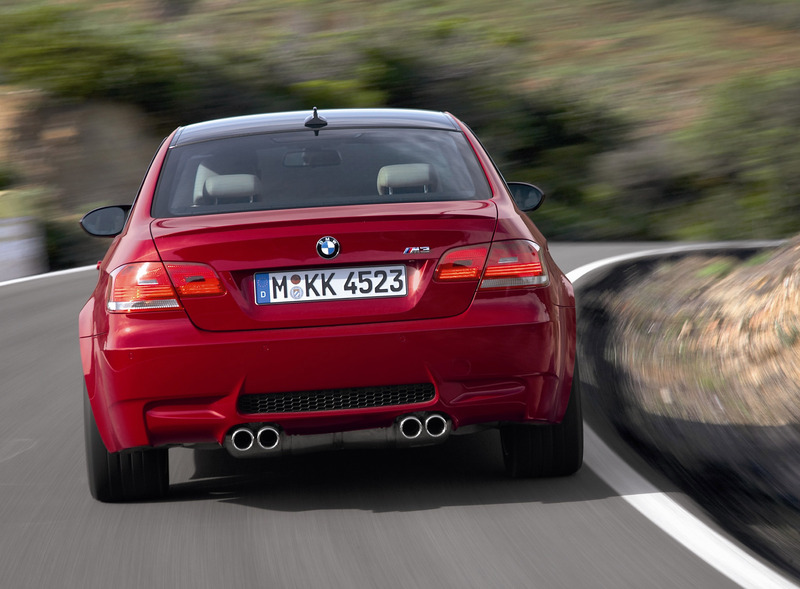 Imposing performance powers the new BMW M3 straight to the front of the field. 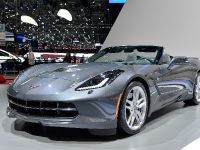 Indeed, the sports car needs a meagre 4.8 seconds to race from standstill to 100 km/h and only at 250 km/h do the engine electronics intervene to place a limit on its acceleration. 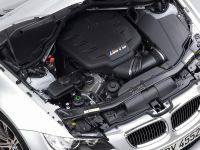 In addition to these performance figures and a specific output of 105 hp per litre of displacement, the power unit's average fuel consumption of 12.4 litres per 100 km (EU test cycle) provides further evidence of the engineering expertise at the disposal of BMW M GmbH. Ideal dimensions for performance at its best. Displacing 500 cc per cylinder, the new V8 power unit fits the vision of the "ideal" held by the most demanding engine designers through its dimensions alone: a similarly powerful six-cylinder would inevitably have deviated from this ideal geometry of a genuine sports engine. The V8, on the other hand, represents the optimum concept in both theory and practice in its dimensions, filling capacity, number of components and weight. 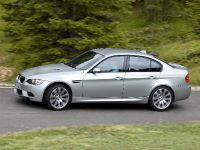 In addition, the eight-cylinder unit possesses typical M engine features, such as double-VANOS, individual throttle butterflies and high-performance engine electronics. 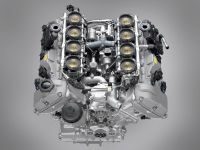 The developers have clearly drawn inspiration from the eightcylinder engine used by the BMW Sauber F1 Team – witness the number of cylinders, M high-rev concept and low weight of the engine. Indeed, the characteristics shared with the brand's current Formula One powerplant run deep. A variety of underlying technological principles, manufacturing processes and materials used for the F1 engine have been carried over in the new BMW M3 unit. 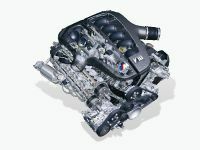 However, with exacting demands placed on the M3 unit not only at race weekends but on an everyday basis, it will always differ in one aspect from its F1 cousin: this high-performance powerplant provides reliable service day in, day out, on every kind of road, in all weather conditions and for years at a time. 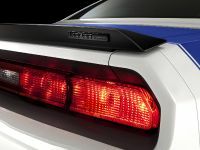 High-revving concept delivers unbeatable thrust. In terms of specific output, the new V8 significantly exceeds the 100 hp per litre acknowledged as the benchmark of sporting power and performance. Power is not everything, though. The dynamic driving experience offered by a car depends to a critical extent on its acceleration properties – and here, the weight of the car and the thrust potential of its engine play key roles. The power channelled through the driven wheels is generated by the engine torque and overall transmission ratio. The M high-rev concept allows optimum transmission and final drive ratios, and thus an impressive application of thrust and power. 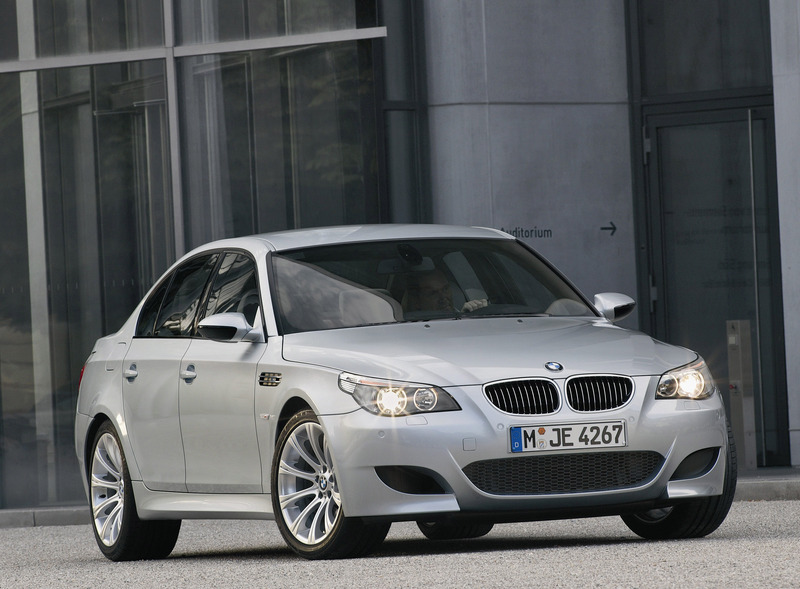 The engine development specialists at BMW M GmbH therefore ensure that the razor-sharp responses of the engine – its instantaneous fulfilment of the driver's wishes – reflects the high demands made of an M car and its overall concept. 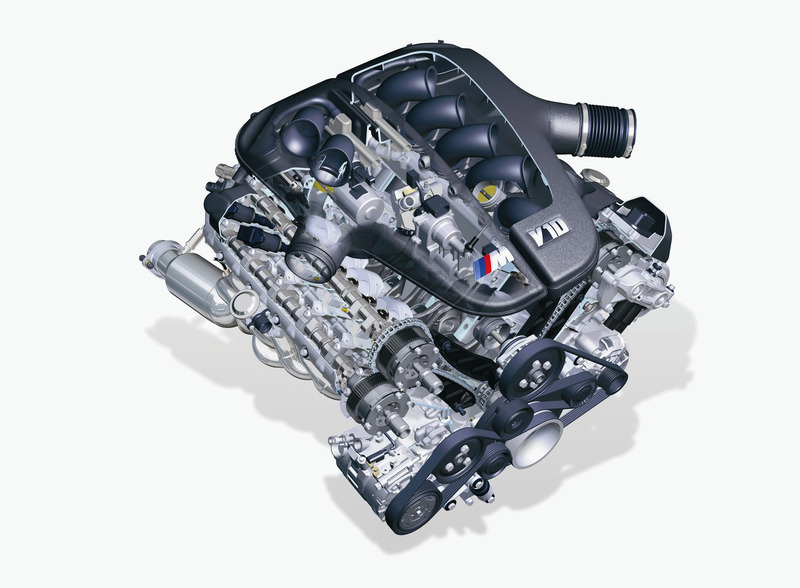 And so, in its performance potential, the development of power, its dimensions and weight, the V8 power unit is an M engine through and through. 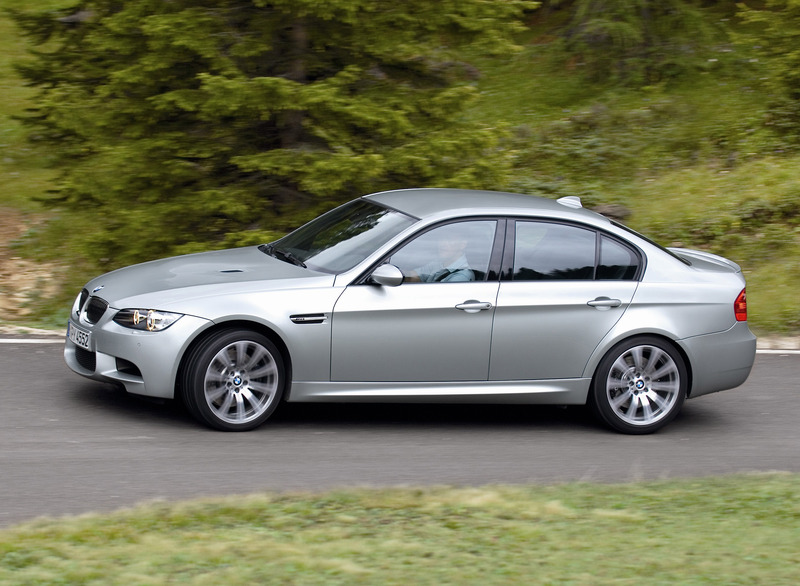 The new BMW M3 sees the engineers taking the high-revving principle to new heights. 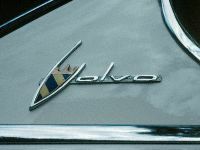 The eight-cylinder engine is capable of a maximum 8,400 rpm, while the second component of thrust – engine torque – rises to a peak of 400 Nm at 3,900 rpm. Some 85 per cent of the maximum torque is available through an impressive rev range of 6,500 rpm, with 340 Nm on tap as low down as 2,000 rpm. These figures are reflected in the performance character of the new BMW M3. 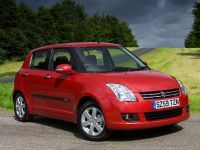 As well as being an extremely dynamic performer, it is an equally convincing choice for high-speed cruising on twisty country roads or the trials and tribulations of city traffic. In the literal sense, however, this engine is very much a lightweight, tipping the scales at just 202 kg. 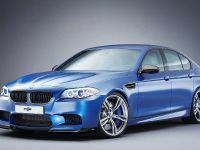 Indeed, the new V8 is even some 15 kg lighter than the six-cylinder engine in the previous M3 – in other words, the engineers have gone much further than merely compensating for the weight of two extra cylinders. Plus, the high-rev concept by nature allows the use of a lightweight powertrain and extremely short ratios. Inevitably, increasing engine speeds also means getting closer to the physical limits. For example, at 8,300 revs per minute – where the engine gives its maximum output of 309 kW/420 hp – each of the eight pistons is covering a distance of 20 metres per second. Massive material loads are generated as a result. This is one reason why the engineers who developed the new eightcylinder engine gave top priority to minimising moving masses. Engine block from the BMW Formula One foundry. 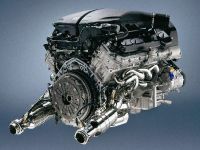 The engine block of the new eight-cylinder powerplant is built in the BMW light-alloy foundry in Landshut, and the blocks for the Formula One units are also produced here. The new V8 consists of two rows of four cylinders at a V angle of 90 degrees and an off-centre arrangement of 17 mm to make the entire power unit extremely compact. Cylinder stroke is 75.2 mm, cylinder bore 92 mm, providing overall capacity of 3,999 cc. The cylinder crankcase is made from a special aluminium-silicon alloy and conventional cylinder liners are replaced by hard silicon crystals. The iron-coated pistons run directly in the uncoated, honed cylinder bore. 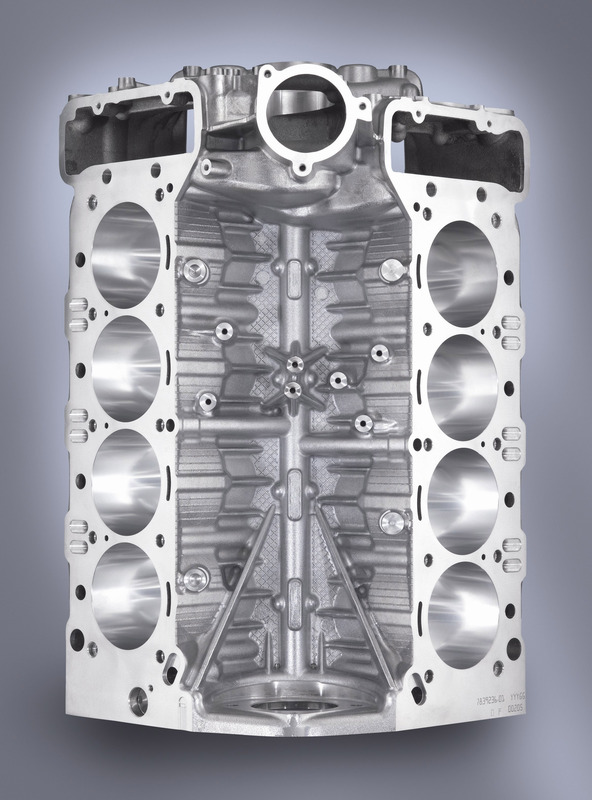 The high engine speeds and combustion pressure place extreme loads on the crankcase. This is why it features a compact bedplate construction demonstrating excellent torsional stiffness, which ensures extremely precise support of the crankshaft. The relatively short, forged crankshaft likewise boasts high bending resistance and torsional strength, yet weighs only 20 kg. Compared with conventional systems, the cross-flow cooling concept of the new V8 power unit significantly reduces pressure losses in the cooling system, spreading out temperatures smoothly and consistently throughout the cylinder head and thus reducing temperature peaks at critical points. To ensure a perfect flow of cooling around each cylinder, the coolant flows from the crankcase via the exhaust side crosswise through the cylinder head, and via the collector rail on the intake side to the thermostat and the radiator. Eight individual throttle butterflies are electronically controlled. It is not only in motor racing that the principle of one throttle butterfly per cylinder is the go-to solution when it comes to ensuring instantaneous engine response. The new powerplant for the BMW M3 comes with eight individual throttle butterflies, four on each row of cylinders operated by separate actuators. 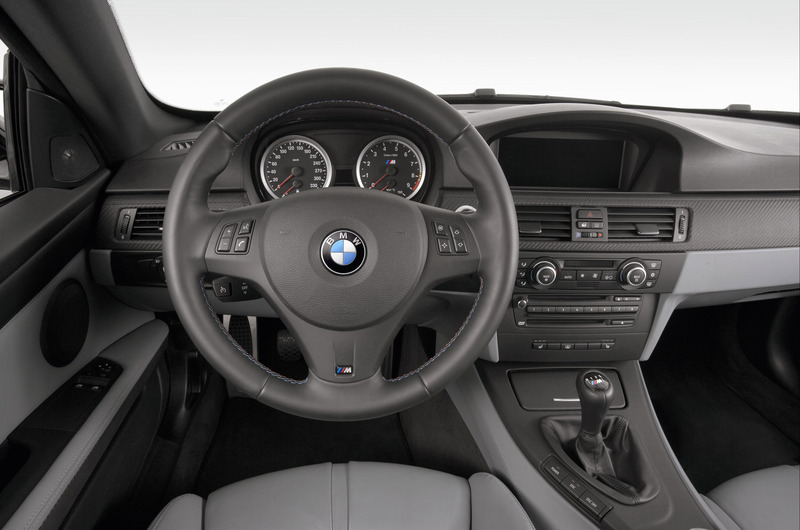 This throttle butterfly management is fully electronic and extremely fast, giving the engine sharp responses across the whole engine speed range and allowing the M3 to act immediately on the driver's request for full engine power. To ensure lightning dynamic responses from the engine at all times, the throttle butterflies are positioned very close to the intake valves in the intake manifolds. The overall flow of intake air in the new eight-cylinder power unit does not require the sensor of a hot-film air mass flow meter. Instead of determining engine load by means of this elaborate sensor, which would also have an adverse effect on air guidance due to the geometry of the components involved, the engine management unit of the V8 performs this function. To do this, the system determines engine load under current driving conditions from the position of the throttle butterfly and idle adjuster, the VANOS position, engine speed, air temperature and air pressure. This, in turn, gives the engineers at BMW M GmbH new freedom in the configuration and optimisation of the engine air intake process. And at the same time this management concept operates with maximum reliability. The length and diameter of the intake funnels also help to enhance the charge effect in the oscillating tube. To save weight, the funnels and air collector are made of a 30 per cent glass-fibre lightweight composite material. Greater efficiency and dynamics provided by Brake Energy Regeneration. To further enhance the efficiency of the power unit, Brake Energy Regeneration ensures intelligent energy management by concentrating the generation of electric power for the on-board network on overrun and under braking. This serves to charge the car's battery without soaking up engine power – and, by definition, the energy contained in the fuel. As long as the engine is running under power – i.e. the driver is accelerating – the alternator, as a rule, remains disconnected. As well as extremely efficient recovery of electric energy, this also helps to provide more drive power for conversion into dynamic performance under acceleration. With the number of charge cycles increasing as a result of this efficient power generation, BMW combines its Brake Energy Regeneration technology with state-of-the-art AGM (absorbent glass mat) batteries able to withstand a much greater load than conventional lead acid batteries. 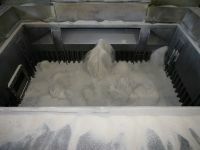 In an AGM battery, the acid is held in micro-glass-fibre mats between the individual layers of lead, the battery thus remaining able to store energy over a long period even when charged and discharged regularly. The CFRP roof. 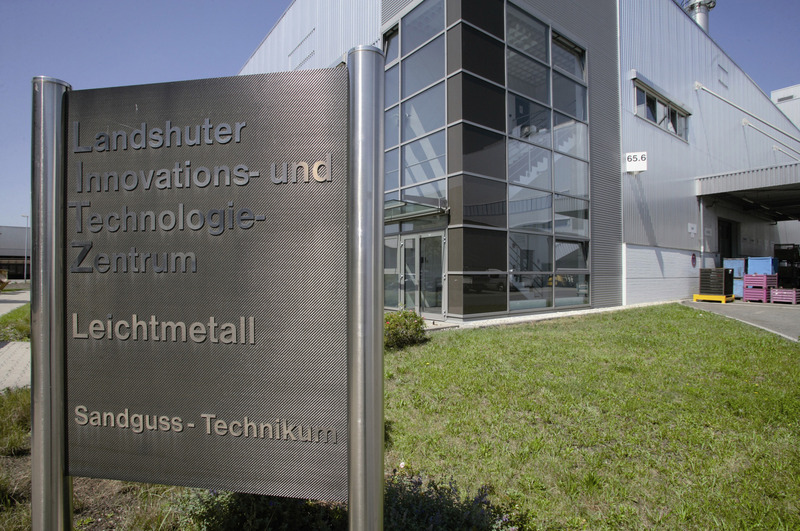 A development highlight from the Landshut CFRP centre of technology. Hardly another body component reflects the advanced technology of the new BMW M3 as strikingly as the roof. Made of carbon fibre-reinforced plastic (CFRP for short) and with only a clear coat covering its high-tech surface, it openly displays the fibrous structure of this Formula One material. 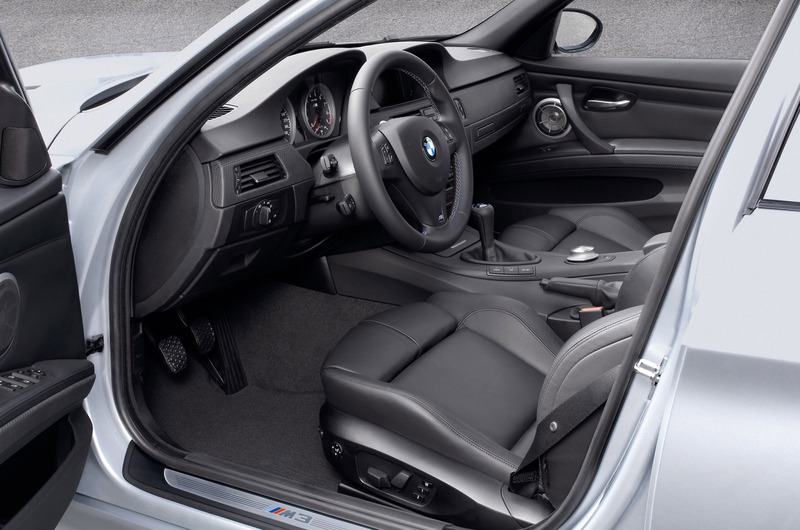 And rarely have the designers and developers of the new BMW M3 followed the purist "form follows function" principle as consistently as when it came to this roof. The carbon fibre reinforced plastic brings about a weight reduction of around five kilograms. By ensuring that the weave of the material remains clearly visible, the roof also reinforces the high-tech aspiration of the vehicle as a whole. 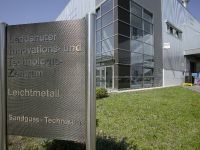 The development of CFRP components has from the start been housed in the Landshut Innovation and Technology Centre (LITZ) set up in 1999. 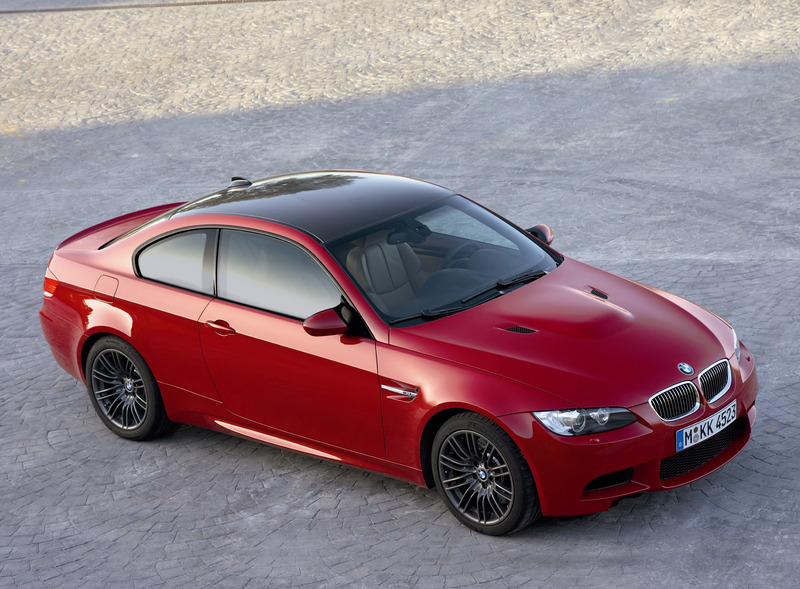 Here, the plastics experts at the CFRP centre of technology largely focused their attention on development techniques for series production of the roof, which was first used in 2003 on the BMW M3 CSL. 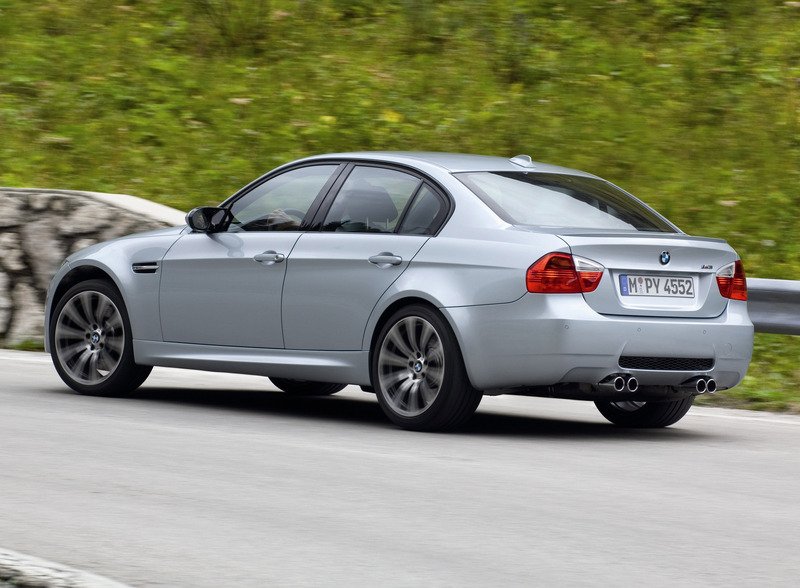 Incidentally, BMW built this very first version of the CFRP roof itself at the Landshut factory. With this achievement, the Landshut lightweight design specialists not only displayed their competence but also their speed and flexibility in the implementation of technologically sophisticated lightweight design innovations. 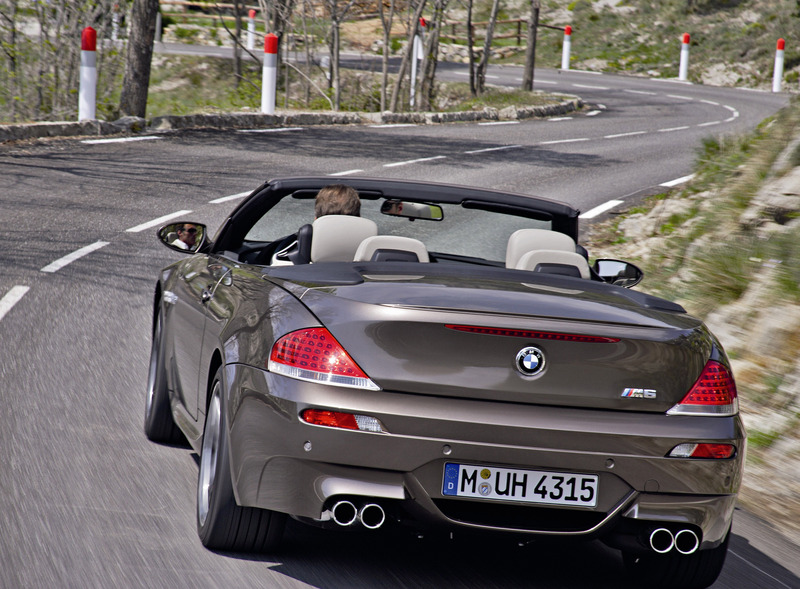 Early 2005 saw the BMW M6 follow suit, likewise carrying a roof made of CFRP. With the market launch of the new BMW M3, the BMW Group started up a new, highly automated production line for CFRP roofs in Landshut so as to meet the sharp increase in production numbers (now M6 and M3) by means of industrialised processes. The production process begins with several CFRP layers being pre-shaped to create so-called pre-forms. Then, in the resin transfer moulding process, epoxy resin is injected into the pre-form that is now inside a press. Following the injection stage, the component hardens inside the press. A further stage sees sections of the component being milled. To lend the roof its particular, stylish carbon look, it is then given a layer of clear coat before delivery to the Regensburg plant ready for fitting. 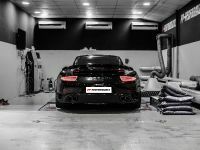 To be able to manufacture the CFRP roof to the exacting quality standards of BMW M high-performance models, innovative tooling and manufacturing techniques are required. These have been developed at the Landshut CFRP centre of technology and are essential prerequisites for standardised industrial processes, while at the same time ensuring high cost efficiency. 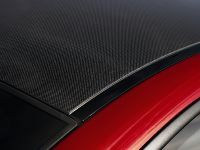 Carbon fibre-reinforced plastic originally stems from space travel and is now in widespread use in many technical sporting disciplines, from Formula One to the America's Cup. 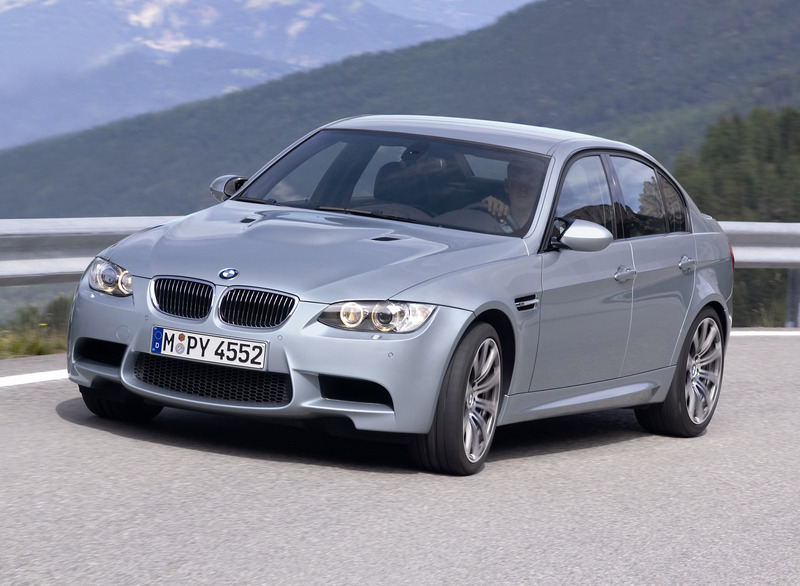 The designers also use this material to further lower the centre of gravity of the new BMW M3. The highest elements of the car body benefit from the weight savings, which has a very positive impact on vehicle dynamics. One particular challenge lay in the area of electromagnetic compatibility, an issue that is currently relevant to car construction in general. The question is: How can the steadily increasing number of electronic components in the car be protected from external electromagnetic interference and thus from malfunctions? 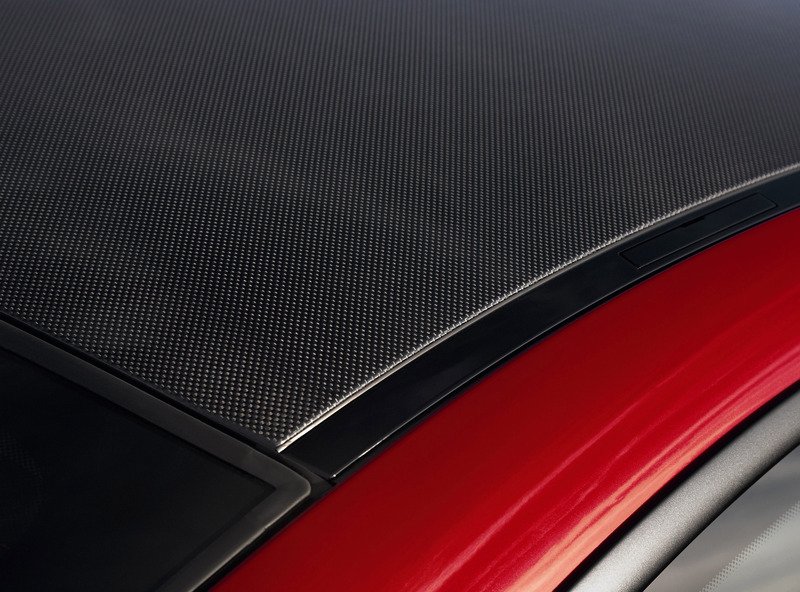 "In order to guarantee the utmost reliability in the M6 and M3, we redefined the material structure of the CFRP roof," says project manager Hanno Buchner. When it came to the M6 bumper brackets at the front and rear, the specialists broached completely uncharted territory in manufacturing a hollow CFRP component, likewise using a fully automated process. The key to this is a newly developed core technology. "We've never had anything like this before," says Klaus Gotterbauer. To create the hollow profile, fibres are woven around a core that was developed in collaboration with colleagues from the foundry. The main hurdle to be overcome in developing this process was not to damage the slightly curved and brittle core while adding the fibre-weave. Finally, liquid epoxy resin is injected into the composite fibre to give the component its strength and stability, and then the core is washed out. 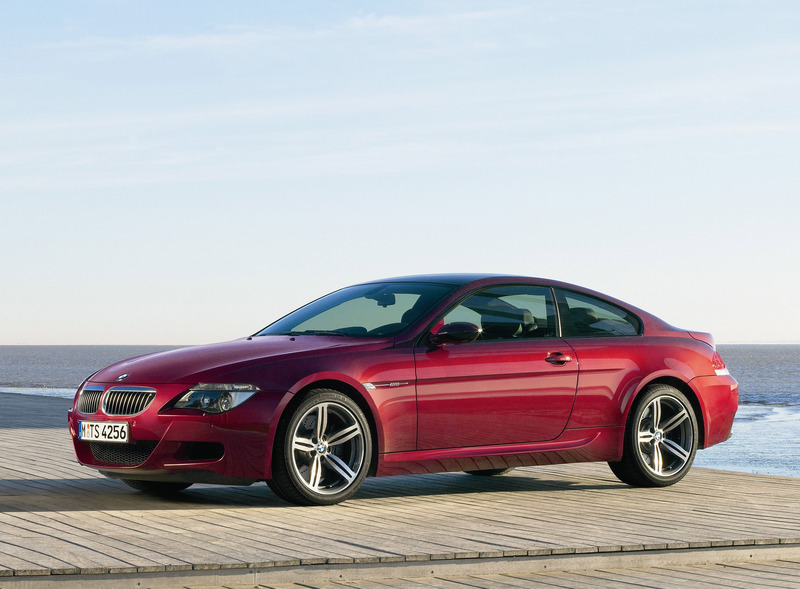 When compared with the 6 Series Coupe, this unique innovation led to a weight reduction of some 11 kilograms per car. 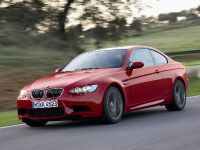 The weight saving of 20 per cent at the front and 40 per cent at the rear significantly improves the car's agility and handling, while its exclusive stand-out feature in this vehicle segment is the roof in its carbon-fibre look. Revolutionary logistics: traceability of cast components. Casting processes are defined by numerous different input values and their interactions. To ensure the quality-oriented production of ever more complex components, a knowledge of the interrelationships between input and target values is essential, along with the timely elimination of errors through specific measures. In particular when it comes to the highly stressed cast components used in Formula One, peak quality levels are paramount. 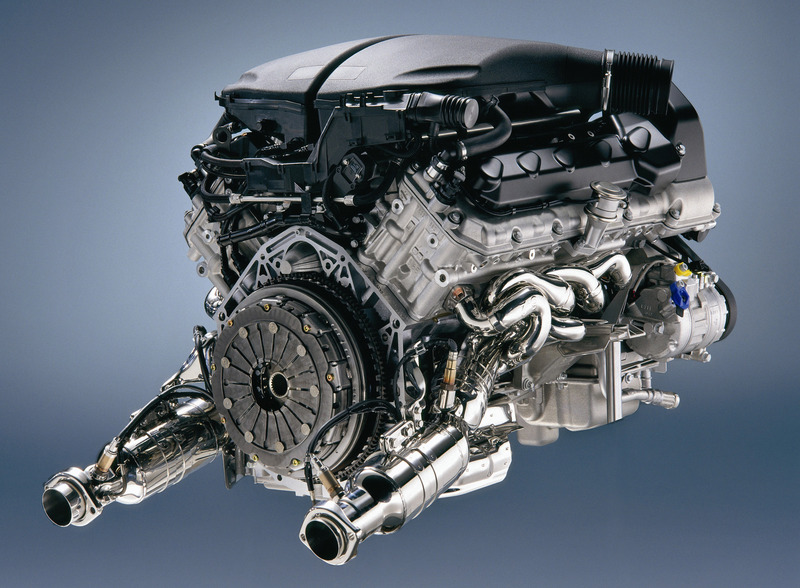 At the time of BMW's return to Formula One racing and the construction of the Formula One foundry in 2001, this prompted the introduction of an innovative documentation system to record every single F1 component along with all its individual processing parameters. The high utility of this system, generating as it did transparency, rapid response speeds and thus optimal quality levels, motivated the quality experts at the Landshut light-alloy foundry to extend it from the Formula One foundry to the whole of series production. On the basis of the complete traceability of components, a quality control system was thus set up within which interactions are identified, individual process parameters are monitored and, where defined limits have been exceeded, appropriate measures can be deduced. In addition, conclusions can be drawn on the dynamic design of subsequent process stages, e.g. for the introduction of a dynamic component test and for taking components from the value-added chain at an early stage. The core constituent of this quality control system is the analytical processes from the area of data mining. The goal is to create models for quality criteria derived from process data measurements on the basis of historical data. Lab work for the future. The modern laboratory facilities of the Research and Innovation Centre (FIZ) allow materials research to be carried out at the highest level and in close collaboration with the Formula One experts. The development of coatings plays an important role here, but the high-tech centre is also used for detection work in the field of damage analysis. Aviation and aerospace technology often serves as a foundation for research work. Some very promising developments that cannot yet be considered for volume production on grounds of cost have already been used in the F1 project. This opportunity to introduce state-of-the-art technologies helps the engineers to continue developing them for series production. Speedy models from the FIZ – rapid prototyping. A new idea, the conception phase, the construction process, the production of the necessary tools, the manufacturing of the new part, the testing period – this is the most expensive and time-consuming phase of any innovation. Since Formula One demands extremely short response times in order to move forward and resolve problems, ways of speeding up the processes are constantly being sought. Here, too, the BMW Formula One team can resort to the FIZ, specifically the Rapid Prototyping/Tooling Technology department. As soon as the required parts have been designed using a CAD system, computer-controlled machines employ laser beams or three-dimensional pressure technology to create true-to-scale models made of epoxy resin, plastic powder, acrylic, wax or metal. These allow the simulation of installation situations and interactions without delay, so that any modifications can be carried out before the final manufacturing process starts. Wind tunnel: synergies for series production BMW is currently building two wind tunnels in Munich that are scheduled to go on stream in 2009: a 1:1 wind tunnel and the aero lab, which in many technical details is virtually identical to that of the BMW Sauber F1 Team in Hinwil. The key common element is the rolling road, a revolving platform that features, among other things, a rotating steel belt resting on an air cushion, which allows for more realistic measurements of flow characteristics around the underbody. The wind tunnel in Hinwil has been operating for more than four years, and since October 2006 has been running three shifts, i.e. it is being operated under extreme conditions. Due to the paramount role played by aerodynamics in Formula One, improvements are developed from one race to the next, i.e. in a fortnightly rhythm. Modern wind tunnels are highly complex facilities which can be run with great efficiency if the workforce have extensive know-how and experience at their disposal. And that is something the relevant staff at Hinwil have developed over the last four years. During this time a whole range of technical optimisation work has been carried out, bringing improvements in the area of reliability as well as measuring accuracy. High efficiency rates are also important. How can you complete as many measurements as possible in the shortest possible time? And how can you keep the costs of operating the wind tunnel at a minimum? For some time now, Munich and Hinwil have been conducting regular exchanges, whether at meetings or in training courses where experiences are pooled and suggestions made. Both sides have access to a shared computer drive that holds important information. Moreover, spare parts are jointly managed, which saves costs. As a direct result of this exchange of experiences and information, the new wind tunnel in Munich can be run more efficiently and cost-effectively. The management of the BMW Sauber F1 Team gave themselves two years in which to complete the team's development phase. That also included expanding the factory. The extension was annexed directly to the building that had stood there since 1992, resulting in an expansion of the overall area from 6,900 to 15,600 square metres (not counting the wind tunnel). That created space for additional machinery and test rigs, as well as for new staff. From 275 employees in June 2005, the workforce rose to around 430. Quite a few of them had previously been working in rented office and industrial space in the vicinity. Planning work for the extension began in October 2005, and by early February 2006 the permit plans had been submitted and at the end of June the authorities granted planning permission. Excavation work could begin in July 2006, and from autumn 2007 the first workplaces were ready for occupation. The concept behind the building, which also has visual appeal, was subject to strict practical considerations. It is designed to ensure short routes and optimal working processes. Here efficiency is paramount, which explains why, for example, the design office and the wind tunnel are linked by an enclosed bridge. The ground floor houses the truck hall. Next to it there is space for large production equipment such as the portal milling machines. Also at ground level are the autoclaves, while smaller machinery is housed on the first floor. The second floor boasts an intriguing visual aspect. This is where the carbonfibre department is based, while the Formula One race cars are serviced at the centre. This central part is designed as an atrium to permit a view of the race cars from the third floor as well, where the wwwin department, the design office and the vehicle electronics department are housed. The wind tunnel: breezing along. Immediately next to the new building is the state-of-the-art wind tunnel that went on stream in spring 2004. Measuring 65 metres long by 50 metres wide and 17 metres tall, the edifice is striking for its glass facade. It contains the workplaces of a whole number of specialists – as well as the aerodynamicists, these include the model designers and builders, CFD (computational fluid dynamics) engineers and other staff in the aerodynamics department. From a total of 35 during the Sauber era, their number has now risen to over 80. Since October 2006, the BMW Sauber F1 Team – like the other leading teams – has been running a three-shift, round-the-clock operation. The facility boasts state-of-the-art technology for all the relevant factors such as wind speed, size of the test section and models, dimensions of the rolling road, the model motion system and data acquisition. The wind tunnel is designed as a closed circuit with a total length of 141 metres and a maximum tube diameter of 9.4 metres. The weight of all the steel elements together, including the fan housing, amounts to 480 tonnes. The single-stage axial fan with carbon rotor blades uses 3,000 kW of power when operating under full load, allowing wind speeds of up to 300 km/h. To ensure that no unwanted vibrations are transmitted to the equipment, the axial fan is mounted on vibration dampers fixed to a solid concrete base. At the core of every wind tunnel is the test section, where objects are exposed to the air flow. In Hinwil it has a very generous cross-section and rolling road length, providing optimal conditions for precision results. Work is primarily carried out using 60 per cent scale models, although the aerodynamicists also have the possibility of taking measurements from 1:1 race cars. So that the test models are not just exposed to the air stream at the front but also at a slight angle of up to ten degrees, the entire measuring platform can be turned. The platform features a rotating steel belt which simulates the relative motion between the car and the road and which runs in sync with the air stream. Load cells are fitted underneath the moving belt for measuring wheels loads. Beyond the technology, when it came to designing the wind tunnel, great importance was also placed on its appearance. The structure is impressive not just for its size, but the glass-clad facades also underline its unique status as a fusion of industrial structure and event venue. What appears from the outside to be a single, homogeneous hall in fact consists of two clearly separate structural elements: the wind tunnel as such and a wing containing work spaces and an event platform, where partners and sponsors can stage marketing and customer events or seminars amid a unique ambience. The gallery on the first floor can hold 150 people. On visual grounds, the central axis of the wind tunnel tube has been positioned over eight metres above the floor. With the exception of the measuring section, which is embedded in a concrete structure, the circuit of steel elements appears to float in the hall. The two areas are divided by a glass wall to maintain the visual link while effectively keeping the noise of the wind tunnel at bay. The BMW Sauber F1 Team presented its supercomputer Albert2 in December 2006. The 21-tonne facility for CFD calculations was already based on Intel technology (consisting of processors, the motherboard, chip set and server housing) and was at the time of start-up one of the most powerful in Formula One. Albert2 had 256 nodes with two Intel®Xeon® 5160 Dual Core processors each (two cores per processor). That amounted to a total of 1,024 processor cores. The capacity of the main memory was 2,048 GB and maximum computing power was 12.28 TFlops (12,288 GFlops). It wasn't long before another 32 nodes were added, bringing the total to 288 nodes or 1,152 processor cores. Now the BMW Sauber F1 Team has ushered in the next stage and upgraded the existing computer. 384 nodes equipped with Intel®Xeon®E5472 Quad Core processors (four cores per processor) and related Intel technology have been added to the previous system, which means the new Albert3 supercomputer now has a total of more than 4,224 processor cores at its disposal. The computer's RAM has grown to 8,448 GB and maximum computing power to 50.7 TFlops. That is a phenomenal 50,700,000,000,000 computations per second. To match this computing performance, the entire population of Munich and Berlin (4.7 million) would have to multiply two eightdigit numbers every three seconds for a whole year. In the current top 500 rankings of active supercomputers worldwide, this performance merits 45th place (third place among systems in industrial use). The new supercomputer, developed like its forerunner by the Swiss company Dalco and running on CFD software by Ansys-Fluent, weighs in at 38 tonnes yet has a footprint of just 24 square metres. The tremendous technical potential of Albert3 is harnessed for analysis in the field of aerodynamics. With its help, the specialists calculate components for the Formula One race cars, using grid models often made up of more than 100 million cells. CFD plays a particularly crucial role in the development of front, rear and auxiliary wings, as well as in engine and brake cooling. Computer-aided air flow simulation is not in competition with the work in the wind tunnel, but rather complements it. "A great advantage of CFD is that you can represent the air stream visually and that way understand why one component is better than another," explains Willem Toet, Head of Aerodynamics. BMW Motorsport Director Mario Theissen says: "Unlike the other teams, we are not planning to build a second Formula One wind tunnel, but in future will continue to concentrate on the steadily expanding possibilities in the field of simulation."